Interior is a way to say who you are without having to speak anything. Well interior house tell too much things about you like your lifestyle, standard, choice, personality etc. Interior designing is applied for all conditions like small or big house, low or high budget. Furniture, Texture, Colour, Space and Fragrance etc point are consider between the whole processes of home interior. Interior designer have skill and creativity to convert your visualization into real about home as per your choices. 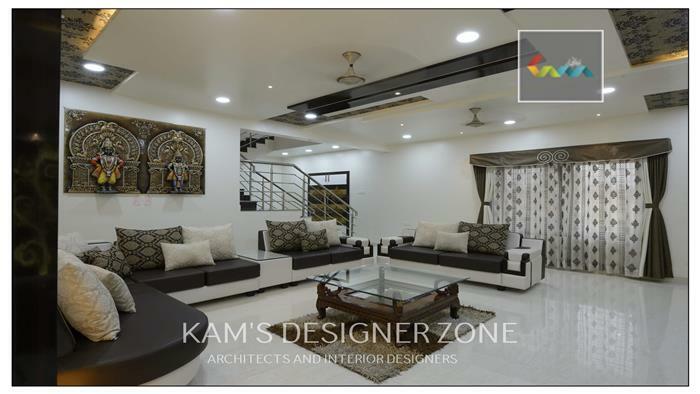 Kam’s Designer Zone is the top Interior Designer in Pune which helps to change your home look with best interior services. Furniture: Furniture selection depends on size of room small scale or large scale furniture. The proper arrangement of furniture shapes your homes and then your homes shape you. It is made by various type of materials like wooden, Bamboo, Metal, acrylic, Glass, Concrete and Blackwood furniture. Texture: Texture means how the external surface of an object feel. Most of the time you recognizing a best interior home with great collection of the entire interior have something is missing. This is nothing other than texture. Rough and Smooth are the two ways of doing texture in interior design. Colour and Space: The room without colour is like a body without heart. Light colour can helps to create room look larger and shiny than original and dark colour increase richness of home. How space is used in home interior? Shows the skill of interior designer. Fragrance: Mood is affected by a fragrance. For example a fragranceful room can change a upset mindset into fresh. So fragrance existence in a room has equal importance like other interior factor. In interior designing use many things to create pleasant fragrance like flower, Scented candles, incense, essential oils etc. .